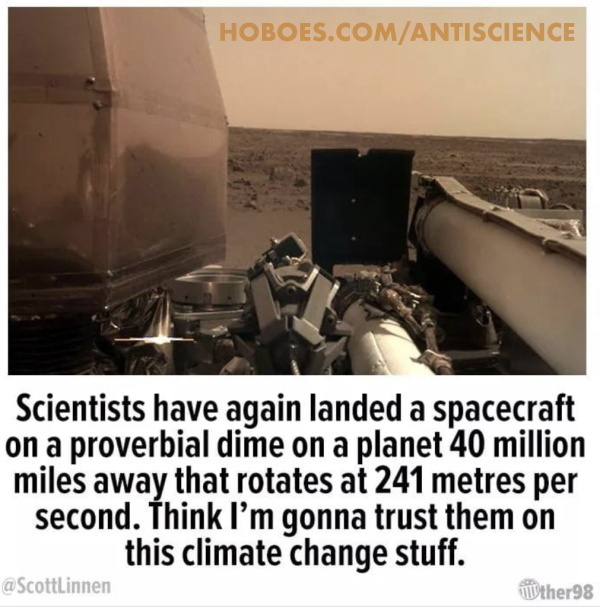 Scientists have again landed a spacecraft on a proverbial dime on a planet 40 million miles away that rotates at 241 meters per second. Think I’m gonna trust them on this climate change stuff. “Sound reasoning” was the comment. But there is no reason in that paragraph. It’s about as far from science and reason as you can get. Regardless of how you feel about spacecraft engineers and climate researchers, they are not the same people, and science does not work by some magical transference of authority. That’s its whole point. Science is not a tribe. It’s a method. Tribalism as science is unsound, unreasoning, and barbarous. That because these engineers over here built something that works, those researchers over there must be right, merely because they are part of some fungible tribe of scientists. Science by consensus is literally—and I use the word literally, literally—anti-scientific thinking and about as unsound, unreasoning, and barbaric a method of solving problems as you can find; it will create far more problems than it solves, and some of them will be deadly. Belief in the infallibility of experts is pre-scientific thought. Only priests are never wrong. Science by consensus is and always has been barbarism. Everyone knows the earth is flat. Only hicks believe in flaming rocks that fall from the sky. Some people are not people, and so can be treated as animals. And the flip side of that, that people are people, and are more important than animals, is a civilized value easily lost to the new barbarism. The scientific method is pure, distilled civilization, and it is completely unnatural. Constructing a theory and then trying as hard as possible to prove it wrong is completely unnatural behavior. But it is the only way science works. We are entering a new witch-hunt in which scientists are derided as deniers, and tribalists proclaim themselves worshippers of science. To paraphrase Mencken and Chesterton, it is one thing to believe in witches, entirely another to believe in witch smellers. When barbarism comes, it will come in the name of a scientific consensus that scientific thinking must be ostracized. The witch-smellers, the barbarians, will redefine science to mean religion—as they always have when the thread of civilization frays. This is a lie, designed to create racial hatred in America. There’s an old saying that when a Republican does something wrong, the fault is on the Republican Party, but when a Democrat does something wrong, the fault is on America. It’s a variation of the name that party game, where a Bob Filner’s party is hidden deep if mentioned at all, and a Democrat like Virginia’s Governor Northam is reported as a Republican as soon as he shows up in blackface and his wife starts handing out cotton. This goes back to the founding of the Republican Party and its opposition to the racial politics of slave-holding Democrats. Democrats wanted to break up the Union. So they accused Lincoln of wanting to break up the Union. Projection is not just a river in Egypt.1 The left loves to project their faults on the rest of America. In the wake of Jeremy Northam’s blackface, Elizabeth Warren’s redface, Ilhan Omar’s antisemitism, and other racist and sexist scandals among Democrats, the left is desperate to divert attention from their own failures by blaming America. This recent meme decries white privilege, not among the elite like Northam and Warren, but among everyone else. It compares two people without a job who endangered their children. 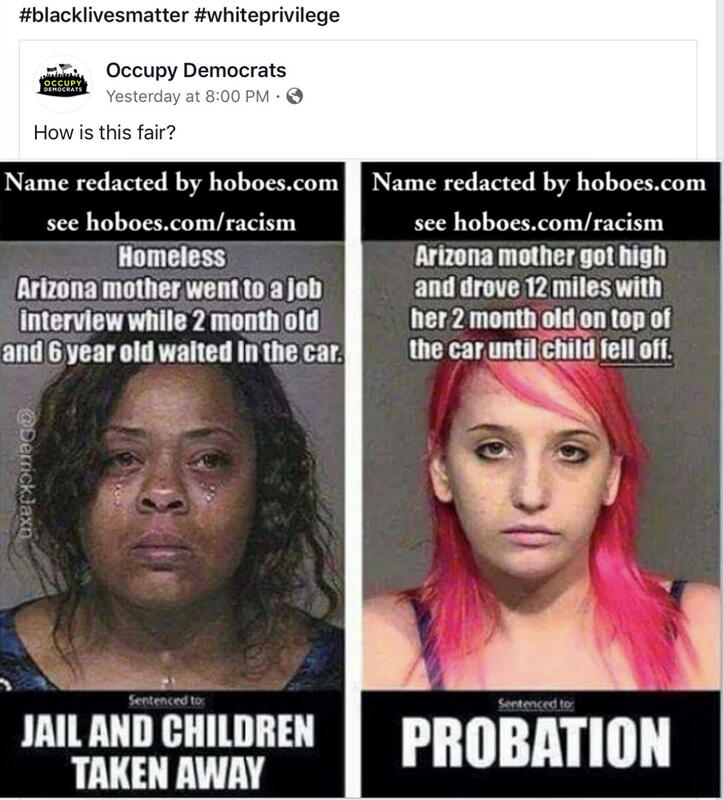 One, a black Arizona woman who left her children in the car while she was at a job interview, had her child taken away and was sentenced to jail; the other, a white Arizona woman who got high and drove away with her child on the top of her car, kept her child and got probation. The hashtags? Black Lives Matter. White privilege. It is worse than fake news. It uses real names of real people and makes up the rest. Both women were sentenced to probation for about the same period of time. Both had their children taken away. Arguably, both should have. Regardless of how you feel about leaving kids in cars, Phoenix, Arizona, is not the place to do it. All the obvious examples of privilege from Democrats, and they had to make up lies about private individuals obviously going through bad times. For all their failures, these women are clearly struggling through serious issues, did not need the publicity, and were probably hurt by the left’s lies. The left doesn’t care. They don’t care about the individuals they hurt. For photos and perhaps other quick notes sent from my mobile device or written on the fly during 2014. 2019 in Photos last modified April 19th, 2019.